The local vault is not available for new users of the 20.1 product. Users migrating from 2012 or older versions will still have local vault. We have removed the ability to create a new local vault. Users can continue to use an existing local vault if it was created with an earlier version of our products. However, if the backup DAT file (under Program Data location) is deleted or if the product is uninstalled & reinstalled the local vault will get removed completely and cannot be created again. The online vault support remains on the new release with some enhancements and our focus will be on making this an even more valuable feature. When the users are logged into their vault and click on the “Home” button, we will take the user to the Identity Safe Home page which contains all of their saved logins, cards and notes. From our 2013 products, we are providing the search box support for 17 regions – US, UK, Canada, Australia, Germany, Belgium, Brazil, Denmark, Finland, France, Italy, Japan, Netherlands, Norway, Spain, Sweden, Switzerland. We will enable the search box by default on toolbar for all the 17 regions. Search results will be localized based on the windows location setting and the search page will be localized based on the Windows Display language. For our 2013 products, we added a new feature to our Scam Insight Protection capability. Similar to the web site Safe Web feature, we are now leveraging our vast amount of reputation data to examine sites that ask for sensitive information. 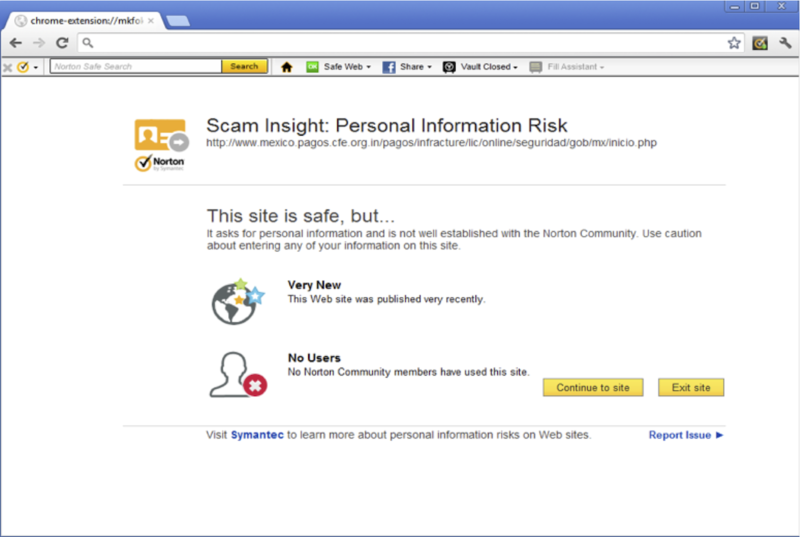 Using this data we now show a warning page when users when the browse to such sites which have a low reputation in our database based on the age and the number of users of the site. We have a separate setting to turn this feature on or off which is available under Safe Surfing settings. This feature is only available for NIS/N360 users and is not available for NAV+IDSS users. We are adding a new feature to the toolbar called “Login Assistant”. When a user visits a login page for which we already have a saved login in the vault and in case of any auto fill issues for that page, then the Login Assistant can be launched to view/copy the logins/cards for that particular page. If any form field is not filled then the user can copy particular fields from The Login Assistant fill the fields manually. The Share feature provides a convenient way to share the browser’s current URL with others, using various social media systems including Yahoo Mail, Gmail, Hotmail, Twitter, LinkedIn and Facebook. Users will be blocked from sharing unsafe URLs. The icon present on the toolbar will change according to the last shared service i.e. by default it will show the Facebook icon and after sharing on Twitter the icon will change to the Twitter icon. As of the 20.2 releases this feature will have a setting to turn in On and Off. We will now show the Fill form info bar only after user clicks on any form fields like First name, Last name etc after browsing to a form page. User browses to a page that has a saved card in the vault, the fill form info bar will immediately appear on top of the page. User browses to a page that has a saved card in the vault, fill form info bar will not appear immediately after page is loaded. Will now wait for the user to click on any fields on the form page and only then show the Fill Form info bar. We are withdrawing the “Minimize toolbar” support for IE browsers. This feature was only available previously on IE. The toolbar is now available in NAV installations. It will be installed during product installation. Users will see two separate folders i.e. two products under Program Files & Add/Remove programs. When user chooses to uninstall NAV, we will prompt them to install IDSS again, if they chose continue to keep IDSS, we will leave the IDSS on the machine and uninstall NAV only. All those changes are great, and i think you have done a GREAT job creating a less buggy and more beautiful Norton Identity Safe, but it still requires alot of code optimization and bugfixing. It crashes quite a lot and can cripple the browser or crash it. It happens more often with slower computers, but even my pc experience it sometimes (browser sluggishness/lag/crash) I'm using an overclocked i7 2600k running at 4.6ghz on a Samsung 840 Pro SSD and 16GB 1600mhz CL8 RAM, so speed is definitely not the issue. So how's that online ONLY vault "idea" work'in out for ya so far? Lot's of happy and satisfied online vault using customers? Lot's of hapless lemmings following you over that cliff? Any "idea" on when it will actually be useable? Any "idea" on when it will really be reliable? You'll figure it out eventually, won't you? The Online Vault still appears to be unreliable. Please return the Local Identity safe for those (read many) that want it.